Nuts and seeds, in moderation, are a healthy addition to a well-balanced diet plan. Brendan Brazier, author of "Whole Foods to Thrive" and creator of Vega nutritional products, recommends cashews as a nutritionally diverse nut, in addition to walnuts, almonds, macadamia nuts and pecans. Cashews are high in essential nutrients, vitamins and minerals needed for normal bodily processes and functioning. The "IBS Cookbook For Dummies" recommends soaking cashews prior to use to reap increased health benefits. Consult with a dietitian or health professional to determine what may best suit your individual needs. Soaking cashews prior to using them for eating and cooking purposes aids in proper nutrient absorption. "The IBS Cookbook For Dummies" cites that soaking nuts and seeds helps remove enzymes called phytates that hinder vitamin and mineral absorption. Inadequate absorption of certain nutrients and minerals may lead to nutritional deficiencies. Cashews are a source of manganese, magnesium, phosphorus, copper and vitamin K. In addition to other negative effects, poor magnesium and vitamin K intake may lead to lethargy and muscle weakness as well as blood clotting issues, respectively. 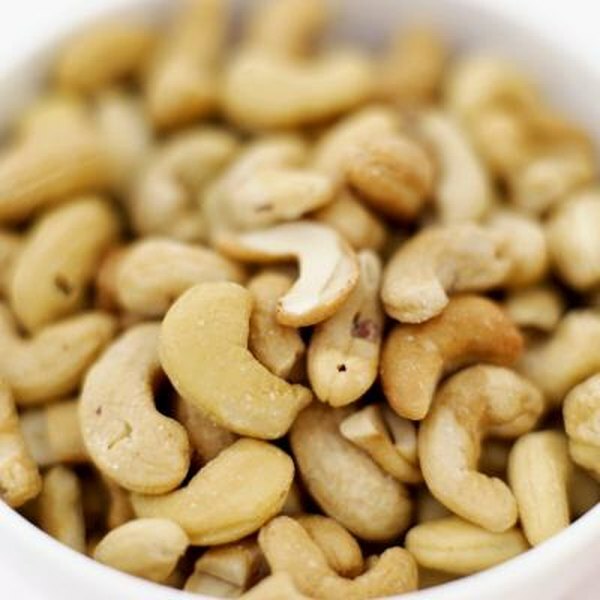 Soaking cashews initiates the sprouting process, which releases additional nutrients. Because the nuts are not cooked, nutrient breakdown -- such as the conversion of fats into fatty acids, proteins into amino acids and carbs into glucose -- can occur naturally, allowing for normal bodily functions and energy metabolism. In addition to increasing nutritional value, sprouting may assist in preventing food spoilage and shortages, according to Natural News.com. Sprouting times vary depending on the nuts, seeds, grains or beans used. Elana Amsterdam of Elanaspantry.com recommends soaking nuts overnight, while the "IBS Cookbook For Dummies" recommends approximately eight hours for 1 cup of nuts. Soaking nuts and seeds helps remove possible irritants, pesticides and chemicals that could lead to negative health effects. In addition to removing possible mold that could cause food poisoning, lethargy and weakness, soaking aids in improving general digestive processes. It may relieve symptoms of irritable bowel syndrome in people who suffer from constipation, bloating, flatulence and cramping, according to the "IBS Cookbook For Dummies." Purchase raw, shelled, unsalted and organic nuts to decrease the risk of contamination. Soaking cashews in liquid prior to use in recipes imparts a greater flavor and texture. Blending the soaked cashews in liquid further increases a smooth, light and creamy texture that is ideal for creams, sauces, dips, desserts, smoothies and ice creams. Furthermore, blending them creates a nut butter that can be used as an alternative to peanut butter or other nut butters such as almond and hazelnut.